If you’re a parent, then odds are you have heard this little gem more than a few times from well-meaning advice-givers: “Sleep when the baby sleeps.” It’s the cute, pat little advice that new moms often hear at baby showers. The idea here is that, if you sleep when the baby sleeps, you end up getting enough sleep to get by without having to suffer through serious sleep deprivation. Sleep when the baby sleeps? HA HA HA YEAH RIGHT. In our opinions here at The Baby Sleep Site®, this is some of the most maddening and frustrating advice that new parents hear. And in today’s post, we’re telling you why. Keep reading! For starters, newborn sleep is anything but predictable. This means that most parents have no idea at all when the next newborn nap is coming, or how long those night stretches will actually last. A nap can be anything from 15 minutes to 4 hours, so you can’t exactly count on any nap time in particular to be long enough for you to get some sleep. In fact, catnaps are normal and healthy during the newborn stage, so in the time it takes you to set the baby down, get yourself ready for sleep, snuggle into bed, and attempt to drift off, your baby may have already had his fill of a catnap and be ready to eat again! Second, this advice utterly fails to account for a very real phenomenon: postpartum insomnia. The truth is, new parents (new moms in particular) struggle to fall asleep and stay asleep after giving birth. This seems like a sick, vicious cycle (you need sleep, but as soon as you can get it, you can’t actually FALL asleep), but it’s a fact, and it makes ‘sleep when the baby sleeps’ even more maddening. Sure, every mom would love to be able to fall asleep in .2 seconds and catch a 20 minute power nap whenever the baby drifts off, but in truth, many moms need 20 minutes just to relax and fall asleep! It’s also a fact that ‘sleep like a baby’ rarely works well simply because our adult bodies just are not programmed to sleep that way. 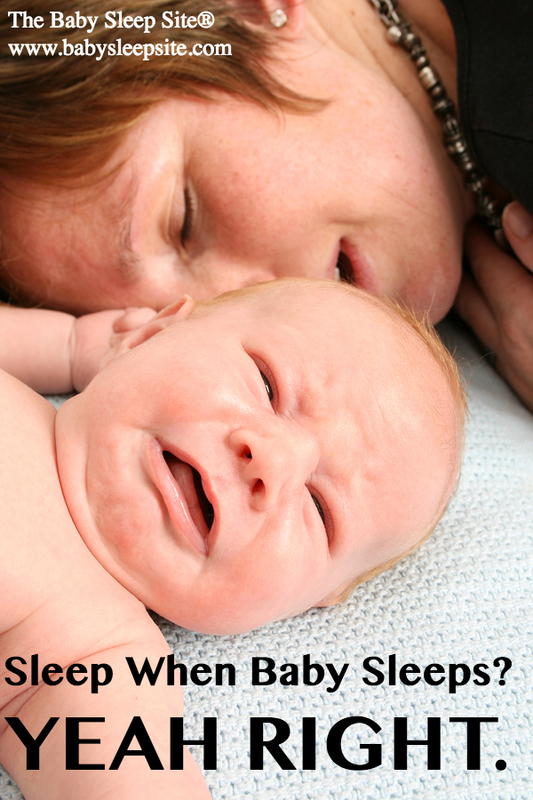 Your newborn’s body is designed to sleep in short cycles, but yours? Not at all. Your circadian rhythms need 7-8 hours of sound sleep at night, and maybe an occasional short nap during the day. Try as you might, you cannot sleep in short bursts throughout the day and night and then expect to feel good and rested. You probably won’t. What’s more, your body will no doubt resist your attempts to take a bunch of naps during the day. Finally (and perhaps most frustrating of all), ‘sleep when the baby sleeps’ assumes that you have ZERO responsibilities besides caring for your baby. But for so many modern-day moms, this isn’t the case. For one, many of us have other children at home to care for! And you can’t exactly sleep whenever your newborn sleeps if your toddlers is standing in front of you, asking for more juice and more Elmo. But even if you have just one child at home, you may very well need to go back to work shortly after birth. And how exactly are you supposed to sleep when the baby sleeps from the office? Get help from friends and family. In the early weeks after birth, solicit all the help you can. If other people are making dinner and mowing the lawn and folding clothes, you don’t have to – and that might actually leave you more time to really rest. Get your partner or a close family member to care for the baby sometimes. Now, this might be anecdotal, but in my experience, the only way I ever managed to sleep during the day was when I knew someone else was taking care of the baby. I knew that the baby might wake and cry, but that wouldn’t be my problem to deal with at that moment….and somehow, knowing that always helped me to relax and fall asleep instantly, and sleep for a pretty long time! Same goes for the night shift – maybe ask your partner to take a night and get up with the baby so that you can get some uninterrupted sleep. Cultivate good sleep hygiene. You may not be able to drift off at a moment’s notice, but cultivating good sleep hygiene will help ensure that when the opportunity arises, you’re able to fall asleep. Try limiting (or cutting out) caffeine, turning off all screens 30 minutes before bedtime, practicing deep breathing, etc. Sleep train. Honestly, the only way to reclaim your sleep fully is to coach your baby to better nights and rested naps. When you sleep train and help your baby learn to fall asleep independently, you are that much closer to sleeping through the night and enjoying a rested, predictable nap schedule. No amount of sleeping when your baby sleeps or asking for childcare help will get you the kind of quality sleep that sleep training will. Did you hear the sleep when the baby sleeps advice? What are your thoughts on it? Share your tips, stories, questions, and suggestions by scrolling down; we love to hear from you! Both I and my wife found “sleep when the baby sleeps” really helpful and useful advice. I guess everyone is different! Thanks for reading The Baby Sleep Site! I’m sorry you didn’t like this article. Our sleep advice is as evidence-based as possible, but we also work with parents around the world, and there is considerable difference in what is “normal” when it comes to sleep in different cultures. For example, I stayed home with my babies and absolutely napped whenever my babies did, since I wasn’t getting good night sleep. This is not to say that everybody should go off and do that if there are other good options, but we do want to encourage parents to find a way to get everybody sleeping in healthy ways that work for their unique families and specific circumstances. We don’t believe in a one-size-fits-all approach to sleep. I hope this helps, and please let us know if you have any questions! This is so true for me. I am completely drained. My husband is deployed and we don’t have family close by or friends that are available. For the last 3wks I’ve been taking care of our 6wk old alone. It’s difficult to sleep when the baby sleeps as there are dishes, laundry, and errands to be done as well as taking care of our dog and taking time for myself to at least shower. On top of that our son has reflux and has been consistently congested so he doesn’t always go down easy or for long unless I hold him upright. I was beginning to feel like a failure as a mom and that maybe my time management skills weren’t as good as I thought. Thank you for this article! Hi @Krystal – Thank you for taking the time to write and hang in there! We know how tough this time can be! I’m writing this comment while watching my 2 months son fall asleep for 1:30 now ?. THANK YOU FOR THIS POST!! This was my #1 most hated comment after I had my son. How the heck was i supposed to just quickly fall asleep on top of the new mom paranoia. Also, thank you for mentioning the PP insomnia. I unfortunatly had some postpartum issues and the PP insomnia was my number 1 symptom. I have gotten help and this is improving, but it is very real.